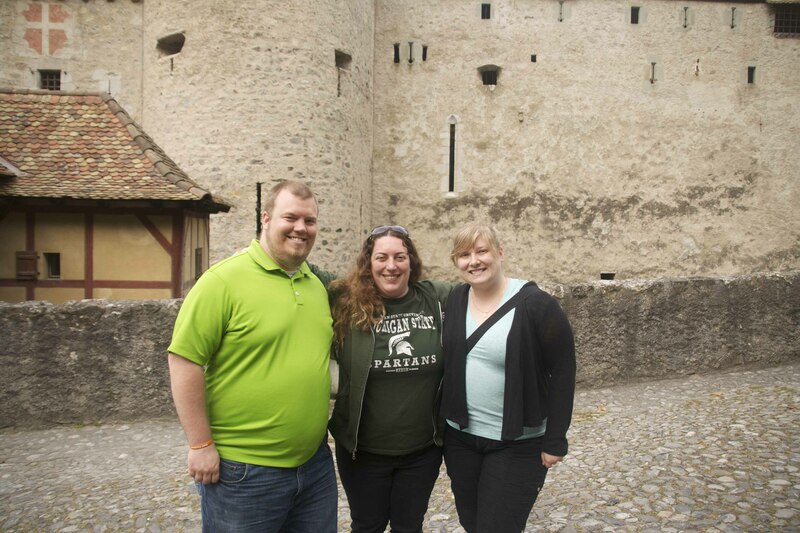 This week’s BEACON Researchers at Work blog post is by MSU faculty member Kristin Parent, with John Dover. 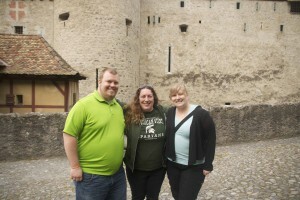 Jason Schrad, Kristin Parent, and Natalia Porcek at the PVA meeting in Switzerland. This year marks the 100th anniversary of the discovery of viruses that infect bacteria—the bacteriophages. One may think (as many do) that there is little else to gain by continuing to study bacteriophages (often shortened to just phages), but like their bacterial hosts, there is actually still a lot to learn. In fact, I recently attended a Phage and Virus Assembly (PVA) meeting, and the same theme kept coming up: despite 100 years of research, there is still so much that we don’t know. It might be surprising to learn that the number of phages (~1031) is ten times greater than the number of bacteria (~1030). In fact, one handful of water from lake Michigan contains more phages than there are people on Earth. Think about that the next time you go swimming! Frederick Twort, in 1915, discovered that bacteria were susceptible to phages, along with Felix d’Herelle’s independent discovery two years later. The next few decades proved to be a robust period for phage research, with an avalanche of studies culminating in >62,700 published papers (as of June 23rd 2015). The 1920s saw the birth of “phage therapy”, in which phages are used to combat bacterial disease. In the 1930s, the phage life cycle was established and is now an introductory biology textbook staple. The 1940s and 1950s saw the use of phages in the famous Hershey/Chase experiment that conclusively showed that DNA is the genetic material, and phages were used in the explosion of molecular genetics studies that followed. In actuality, phages were used as tools that directly contributed to the vast majority of genetic manipulations that are now routine in the laboratory. Phage work continued strong into the 1960s and 1970s where phages again led the way in the creation of methods that are commonplace in the modern laboratory: negative staining in electron microscopy, the use of transposable elements, and DNA sequencing, wherein the first complete genome sequenced by the eponymous Sanger was a phage genome. Research in the 1980s and 1990s revealed that phages were everywhere—in all terrestrial and aquatic biomes. 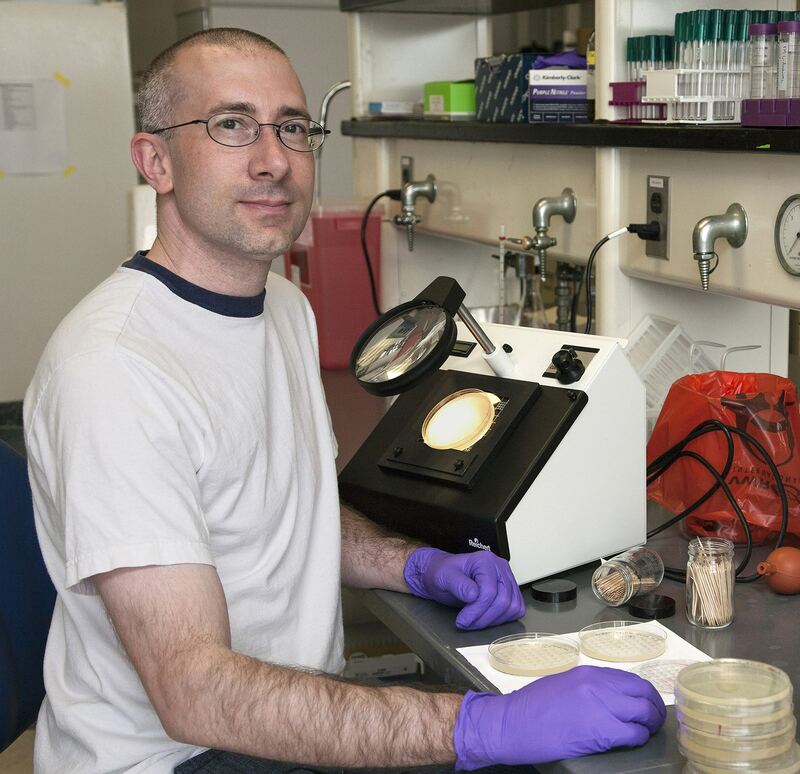 The metagenomics boom starting in the early 2000s gave clues to phages in the human microbiome, and they are now actively being investigated as part of the virome of the microbiome. There are more bacterial cells and phages in your body than there are human cells, and phage/host interactions contribute an enormous amount to our bacterial diversity, and yet, we know so little about them and how they evolve. In the last ten years, advances in cryo-electron microscopy have given us images of the beautiful structures of entire phage particles, which are complexes of thousands and thousands of proteins. We are only now starting to understand how these elegantly assembled structures work as molecular machines. Despite the huge mass of information gained during the past “phage century”, there are still numerous aspects of phage biology that remain a mystery. One part of this mystery is how a phage, or any virus, recognizes and successfully infects its “favorite” host. Such a process is critical to virus survival. In all environments there is great diversity in both viruses and hosts resulting in an enormous challenge for viruses to encounter and infect suitable targets. My laboratory is focused on how phages efficiently recognize their hosts and transfer their genomes into those hosts. We use a combination of microbiology, biochemistry, structural biology, and experimental evolution to investigate these processes. One of the phages that we use as a model system is Sf6, which infects Shigella flexneri. Natalia Porcek, a graduate student in my lab, has shown that Sf6 uses a host cell outer membrane protein, or “Omp”, for infection. Her work has shed light on protein-protein interactions critical to Sf6 entry into its host, and her work has contributed to an understanding of host range—specifically, how Sf6 can recognize Shigella and Salmonella species but not E. coli. Another graduate student in my lab, Jason Schrad, is also working toward understanding this process by using cryo-electron microscopy to look at Sf6 during the process of infection. John Dover counting plaques in the lab. 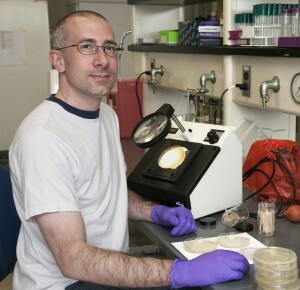 John Dover, a technician in my lab, and Alita Burmeister, a collaborating student from the Lenski lab, are using Sf6 for experimental evolution studies aimed at understanding how phages can adapt to infect different hosts. These studies have revealed a potentially novel evolutionary mechanism distinct from other phages such as lambda. Sf6 is a member of a class of phages that packages “headfuls of DNA” in its capsid, a protein shell that encloses the DNA. This means that the phage packages DNA until no more can fit in the capsid container, which is more DNA than needed to encode a single genome. We have seen parallel evolution across ten phage lineages that show whole gene deletions as a path to fitness. In some cases, as much as 15% of the ancestral genome was deleted. Since the phage packages headful, that would mean that a new genomic composition (replacing 15% of the DNA), is contributing in some way to a faster life cycle. Their work has also found parallel evolution of cell lysis timing, which is the temporarily controlled stage of the phage life cycle that breaks open the bacteria and releases new phage “babies”. Faster lysis allows the phages to infect the next group of cells in its controlled environment earlier, making the phage more fit. We still have much more to do to fully understand bacteriophages. We are in an exciting time as experimental advances have evolved to provide many robust tools for dissecting phage biology, and we are looking forward to the next 100 years of phage discovery. For more information about work in the Parent lab, you can contact Kristin at kparent at msu dot edu. This entry was posted in BEACON Researchers at Work and tagged bacteriophage, BEACON Researchers at Work, Biological Evolution, experimental evolution, microbiology. Bookmark the permalink.